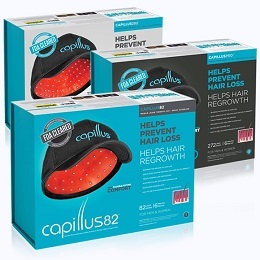 Capillus, LLC is committed to staying abreast of medical advancements and research in hair restoration to increase awareness of biomodulation as a treatment method for hair loss. The company showcased its premiere medical laser devices to an international audience of physicians specializing in dermatology at the American Academy of Dermatology 2019 AAD Annual Meeting in Washington, D.C.
Also featured at the AAD annual meeting, Capillus announced their expanded Cap+ brand line of clinical hair care products, which contains natural ingredients to cleanse, exfoliate, and moisturize hair while promoting overall scalp health. The expanded line of Cap+ products now includes a hair health supplement and 2% minoxidil for women, in addition to its 5% minoxidil for men and other hair care products. The popular Cap+ Bundle, which includes all Cap+ products, is applied to remove build-up in hair, restore vitality to lock in moisture, reduce inflammation while lubricating hair follicles as well as repair hair damage. In furthering their commitment to hair science and research, Capillus will also be participating in the upcoming World Congress for Hair Research taking place abroad in Barcelona on April 24th, 2019. The congress will be a comprehensive, international hair research meeting for the advancement of knowledge in hair growth. The company’s involvement will once again be integral to staying ahead of the curve with new advancements, research, and techniques for the development of hair growth in connection with international hair loss physicians.